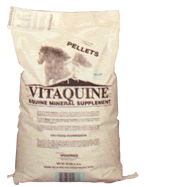 This premium grade nutritional supplement is formulated to provide the horse with vital minerals, trace elements, and vitamins needed for proper maintenance, growth, reproduction, and performance. The anatomical structure of the horse differs from ruminant animals such as cows in that the digestive system is smaller, requiring nearly a constant intake of small quantities of food; additionally, there is little microbial action (necessary for food digestion) by comparison with ruminants. This lack of efficiency of nutrient absorption dictates a daily ration high in necessary trace minerals, vitamins A, D, & E, and the entire B-complex spectrum. The trace mineral selenium is very important in equine nutrition, being indicated in improvement of stamina, increase of muscle efficiency, improvement of conception rate, decrease of pregnancy and foaling problems, improvement of growth rate in foals, and aids in coping with stress. Fed regularly, as recommended, Special Equine Formula provides the horse with excellent supplementation of the vital nutritional factors required for more complete utilization of roughage and grain, improving body conformation, healthier and glossier coats, improved endurance, and vibrant good health. As individual horses may vary greatly in nutritional requirements, the owner or feeder should be the judge of the specific needs of each horse. Some experimentation with the amount fed daily will soon point out the best individual level of supplementation. Other natural feed stuffs and clean water are essential. Horses have special nutritional needs! 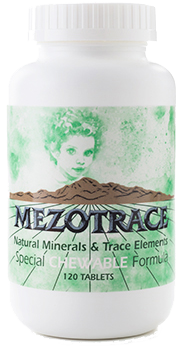 Meet them with Mezotrace’s special equine formula.